No visit to London is complete without taking in the sights that dot the famous River Thames. 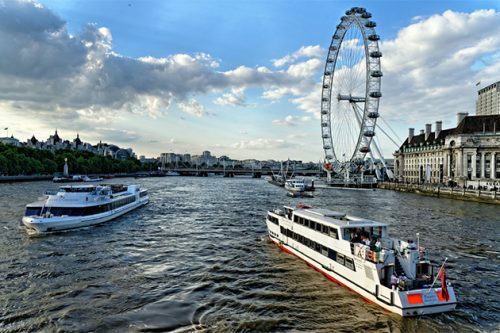 On a London Top Sights Tour, you’ll be able to see 30+ London attractions, plus cruise down the river and see the stunning landmarks that line the 346km waterway. Keep reading for more info on how to cruise down Londons’ most famous river! With a rich history dating back to Roman Times and Norman invaders, The River Thames is now the setting for many Hollywood films, and a gateway to important artistic and cultural centres such as Tate Modern, Tate Britain, BFI Southbank, the Southbank Centre and Shakespeare’s Globe Theatre, as well as modern tourist attractions like the London Eye, the Emirates Air Line cable car and The O2. It’s also the place where you can find out about British history, home to the Tower of London, HMS Belfast, the Houses of Parliament, Royal Museums Greenwich and Hampton Court Palace all have stories to tell. The River Thames is the heart of the British capital. The easiest way to get your sightseeing done in one go is to take a river boat cruise, which is easy with a Top Sight Tour! During the walking tour, you will start in Green Park & then head to Westminster. Sights we’ll see along the way include Buckingham Palace, Downing Street, Westminster Abbey, Big Ben, Parliament Square, the Houses of Parliament. After You’ll head over to the London Bridge area where Shakespeare’s Globe Theatre, The Shard, HMS Belfast, Tower Bridge, London Bridge and the Tower of London are all located. After that it’s time to see all of the sights from a new perspective aboard your Thames Cruise! Finishing at Westminster Pier. prepare to take in one of London’s most politically significant and picturesque neighbourhoods, Westminster is one of the river boat cruise’s biggest highlights. With the opportunity to take gorgeous photos of Big Ben and the Houses of Parliament from the River Thames, it’s also worth hopping off to explore Westminster Abbey. Interested in private London tours? London guided tours, and other London tours all led by fun London tour guides? Check out the links below!